For a long while, NEXUS has owned two five octave marimbas and a vibraphone from Adams Musical Instruments . Adams, based in the Netherlands, manufactures timpani, marimbas, bass drums, chimes, mallets, temple blocks and many other percussion instruments. The DRUM BOOGIE FESTIVAL is just around the corner! It’s on SATURDAY, September 17th, 9:30am – 8pm at CORNELL PARK, in Kingston, New York. (rain date: Sunday Sep 18th). Click HERE to read about the back-to-back concerts at the Ottawa International Chamber Music Festival on July 31, 2011. 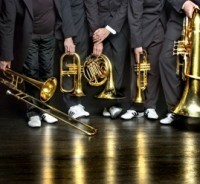 Click HERE to read about the July 2nd Concert featuring NEXUS and the Canadian Brass in Woodstock, NY. NEXUS is off to the beautiful Shenandoah River Valley in Virginia to perform and work with the students of Shenandoah University’s Conservatory in Winchester. Craig and Joel have been busy today loading the truck. NEXUS is heading to the symphony in Austin, Texas and coming home via Shenandoah Conservatory in Winchester, Virginia. Thanks to all of you who enjoyed Saturday night’s concert with us! It was wonderful to see such a great audience, and we have been getting some amazing feedback. Click HERE to read the Toronto Star’s article on David Kent and his long-time association with NEXUS. NEXUS marks its 40th Anniversary season with another ground-breaking performance featuring special guest Toronto Symphony Orchestra timpanist David Kent in music by Cahn, Carter, Ichiyanagi, Philidor and Vivier. Click HERE to read an article by Andrew Timar about the current state of percussion in the concert hall. Andrew specifically looks at the NEXUS March 12, 2011 concert at the Glenn Gould Studio in Toronto.